Get the abs you've been wanting for yearswith this bench. Scientifically designed for more efficient workout. It'sheavy-dusty steel frame is multi-height adjustable, it features dual ankle padsand non-slip rubber end caps. Combined with regular exercise and a sensiblediet, it may help you tighten your abs and shrink your waist. Don't hesitate tobuy it! 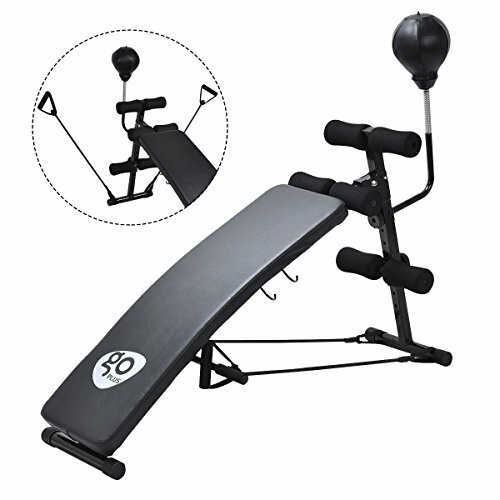 Includes anti-stress speed punching ball toexercise your coordination and reaction velocity. Adjustable bench offers four differentpositions. Heavy duty vinyl cushion pad seatingsurface with dense foam padding. The weight bench is sturdy and durable, andit has non slip rubber coated end caps. Contoured shape foam rollers ensure safeand comfortable workout. 【Effective Full Body Workout】 Equipped with a speed ball and 2 pull ropes, it can not only for abs, but also good for stretching, leg workouts, twists, back sit-ups and pushups. You can exercise different parts of your body with one tool. 【Sturdy Construction and Rust Resistant Surface】We have customized the frame to make it sturdy and stable. The surface is treated with rust resistant power coating. It lasts for long time use with appropriate care. 【Comfortable Cushions and Safe Design】 It features a flat inclined design and with the padded rolling cushions on back which perfectly support your body and eliminate back and neck strain. It makes you comfortable and safe when exercise. 【Four Adjustable Positions】This AB bench offers four different positions to ensure you get the right abdominal crunch workout. A good trainer for people to exercise with different degrees. Solid Material- This Abdominal rocket equipment is made of heavy duty thick steel, very strong and stable. The largest weight capacity is 220lbs and will basically meet most people's exercise needs. 【Easy to Assemble and Store】Clear and brief instruction make it much easier to assemble. And it can be stored under bed when you don't use it. It is not only suitable for gym, but it also can be used at home, office.